If you choose to install TheBflix onto your web browsers, you need to beware or irritating and potentially intrusive adware. It has been discovered that the clandestine infection may present online offers and advertisements which actually are managed by Browse to Save and other suspicious advertisement supported programs. Unfortunately, in some cases these undesirable advertisements could push you into visiting unreliable websites, exposing your private data or just wasting time with bogus and useless offers. As you probably know already, various pop-up offers and advertisements can be used to boost traffic to different websites, some of which could present you with misleading information. Overall, the risks are clear, and now it is your choice whether you want to avoid them by getting TheBflix removed. The suspicious TheBflix is presented at thebflix.info; however, the website is currently down. Despite this, you need to beware of the advertisement supported program hiding behind freeware. If you are not cautious enough about the software you install onto your personal computer, there is a great chance that you will end up installing undesirable computer applications as well. Once installed, whether with or without your knowledge, the application is set to access data on the websites you visit, access your browsing history and manager existing applications and extensions. Needless to say, this is not the kind of activity that you want to have your virtual identity involved with. Other applications which may act in the same manner include wxDfast, Downloadnsave, CodecV and ADDICT-THING. If you have not installed these applications onto your browsers yourself, you can detect them after discovering suspicious and unexpected advertisements on ebay.com, amazon.com, target.com and other popular online web stores. 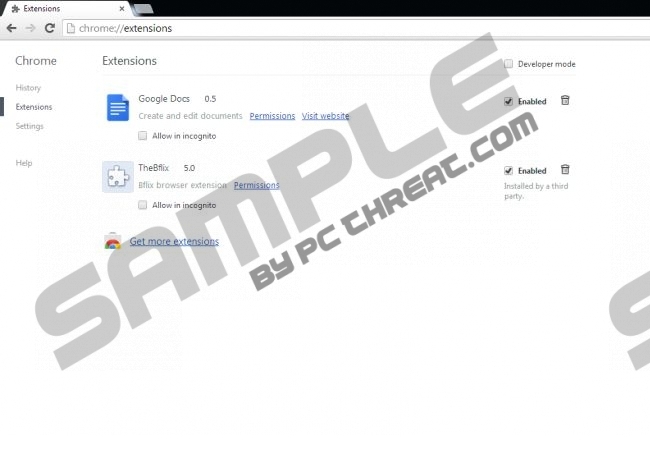 Those browser extensions which have been downloaded onto your browsers illegally or from unreliable sources need further investigation. It is essential that you familiarize yourself with the related privacy policies and install authentic malware scanners to make sure that the suspicious plugins are not malign and harmful. Our virtual security experts recommend that you delete TheBflix from the system right away because this browser extension can flood your browsers with irritating and potentially unreliable online advertisements, surveys, prize-draws and other offers. You can remove the application using authentic security software with automatic malware removal capabilities. You can also try to delete the application using the manual removal instructions below. Make sure to scan the system with a reliable malware scanner if you do choose the manual TheBflix removal. Open the Start menu (click the icon on the Task Bar) and select Control Panel. Double-click Add or Remove Programs to find the undesirable software. Click the undesirable computer application and select Remove. Tap the Windows key to access the Metro UI start screen and right-click. Select All apps, open the Control Panel and click Uninstall a program. Quick & tested solution for TheBflix removal.